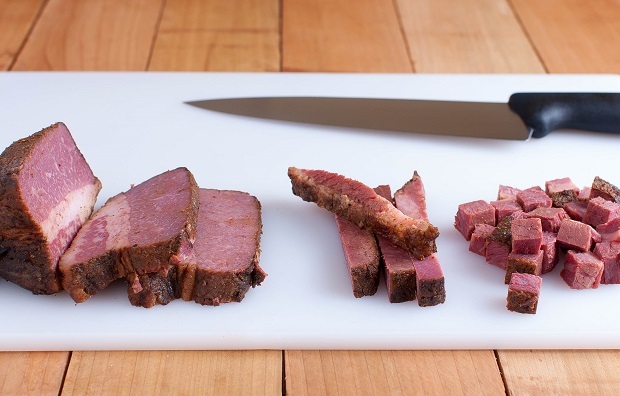 I cooked the corn beef in my Weber Smokey Mountain using the Barbecued Corn Beef Brisket recipe I shared last year. 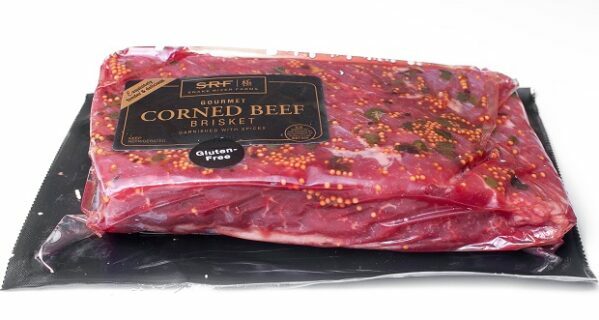 Be aware that corn beef is usually very salty so a soak is needed. Instructions for a soak are in my prior article. For the SRF corned beef I cooked, I removed it from package and rinsed off all of the pickling spices. I soaked it in cold water in the fridge for 2 hours, then drained and replenished with fresh water for another 2 hours. 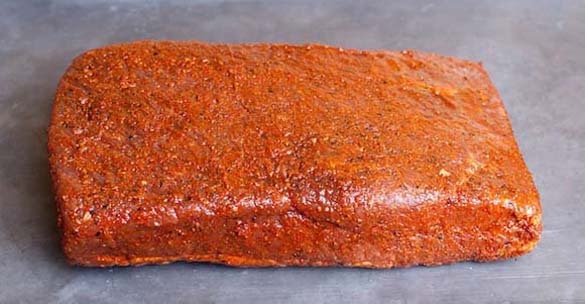 The brisket flat was given a quick rinse and patted dry. If you are not familiar with the saltiness of the corned beef you purchased, I suggest cut off a small slice after each soak and cook it on a saucepan to gauge for yourself. 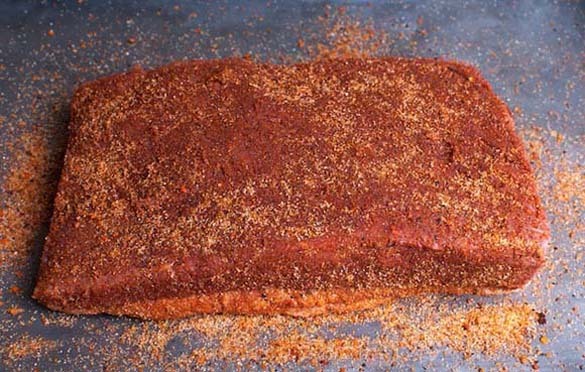 You will want the salt to leach out so you can apply a rub (I used SYD Hot Rub) to re-season the brisket before smoking it. 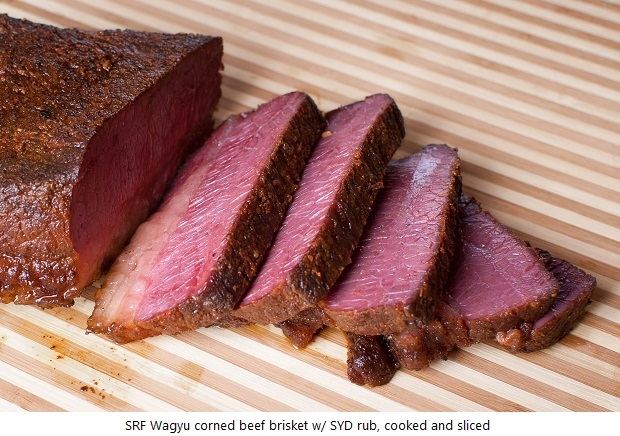 My SRF corned beef brisket was smoked fat-side down in a WSM-18 with several tennis-sized chunks of pecan wood for flavoring. After about 3 hours, the surface crust had set and it was wrapped in foil fat side up with a cup of diluted beef broth and returned to the pit and cooked until probe tender tested using a thin bamboo skewer. The internal temp of my flat was 210F when done but yours will vary so don’t rely on my temp readings. I removed it from the pit and cut open the foil and loosely tented it until I could handle the brisket for slicing (about 150F internal temp). 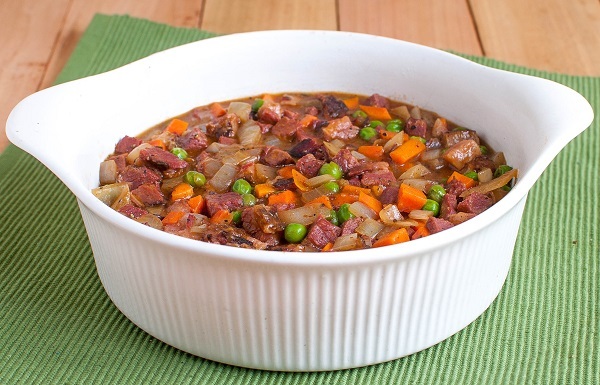 At this point, you can serve it as part of a traditional St Patrick’s Day dinner or refrigerate or freeze the leftovers. “Cottage Pie” is a term known to have been used since 1791, when potatoes were introduced as an affordable crop for the poor. A cottage pie has a meat filling with a crust made of mashed potatoes. Cottage pies were typically made using leftover meat from a previous cook, so this could be beef, pork, lamb, chicken, etc. Vegetables are commonly added along with broth and thickened into a gravy consistency. The “pie” is then topped with the mashed potatoes mixture. Since 1877, “Shepherd’s Pie” was used synonymously with cottage pie. 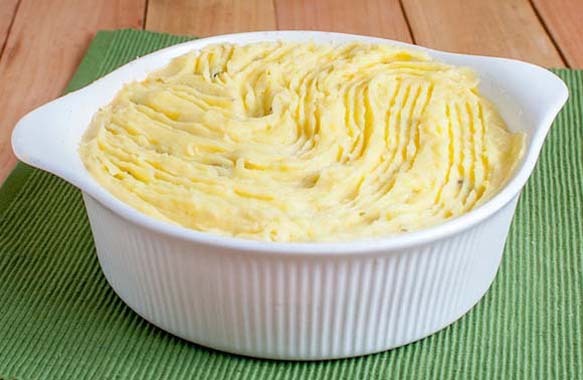 However in more recent times, use of the term “Shepherd’s Pie” is more commonly reserved for a cottage pie that has meat filling made with mutton. 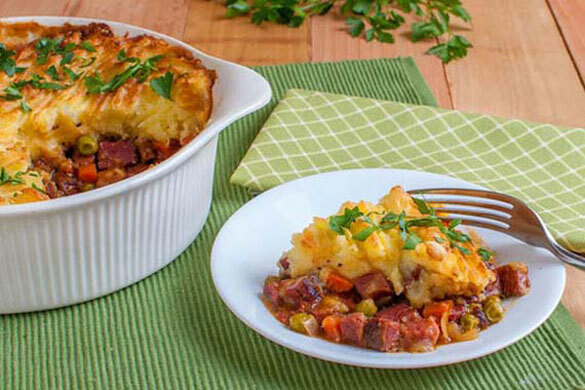 Regardless of what you want to call it, this meat pie with mashed potato crust is absolutely delicious and a great way to use your leftover St. Patrick’s Day corned beef–such as Snake River Farm’s BBQ corned beef brisket seasoned with SYD Hot Meat rub! 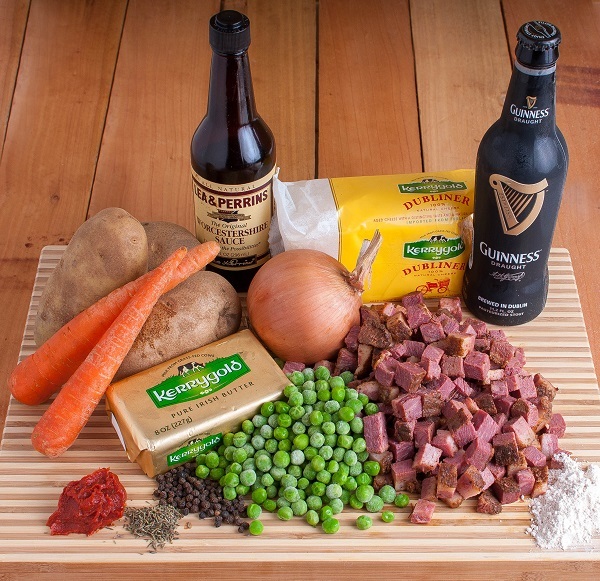 Here’s a delightful Irish-inspired cottage pie recipe using leftover BBQ corned beef brisket with SYD Hot rub, Guinness Draught beer, Irish vegetables, and topped with a creamy crust made of mashed potatoes & Dubliner cheese! 3 oz (about 1 loosely packed cup) of coarsely grated Kerrygold Dubliner Cheese (or your favorite cheese). Take a large non-reactive sauté pan (stainless steel, enameled, non-stick etc.) and melt the butter. Add the diced onions and carrots. Turn the burner on medium high and sauté for about 3 minutes. Then stir in the tomato paste, Worcestershire sauce, Guinness Draught beer, broth and water. Cook for about 5 minutes. Add the diced corned beef, frozen peas and thyme. Cook for a couple minutes until the corned beef is warmed up and peas thaw a bit. Sprinkle in the flour and stir until it thickens up. Add SYD Hot Rub or salt and pepper to taste. The consistency should be that of gravy. If it is too watery add a little more flour, and if it is too thick add a little water. Once the filling is the proper consistency, place it into your baking dish (a 12 inch pie pan or 9 inch deep casserole dish). Drain the cooked potatoes in a colander. They are ready when they break apart easily by inserting the end of a fork. While the potatoes are sitting in the colander, take the hot pan they were in, and add the butter and milk. Cook on high until butter is almost fully melted (or milk is foamy), then turn off the stove. Return the potatoes back to the pan and mash w/ the butter and milk (e.g. immersion blender, etc.). 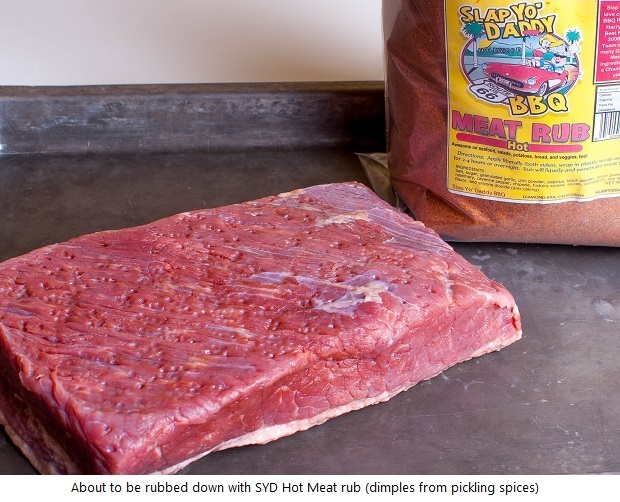 Add SYD Hot Rub or salt to taste. Add white (or black) pepper to taste, or leave out if you like. Once the potatoes are mixed up and seasoned to your liking, gently mix in the egg yolks. Fold in the grated cheese. Dollop the potatoes all over the top of the filling with a large spoon. Once all the potatoes are over the filling, gently smooth the dollops together and run to the potato mixture to the edges of the dish (as to keep the filling from seeping out while baking). You can leave the potato topping smooth or give it an interesting texture if you like (e.g. using a fork, spoon, knife, etc.). Place the baking dish in the 350F preheated oven and bake for 30-35 minutes or until crust is golden. Once finished baking, take the pie out and let it cool down for about 5-10 minutes. Garnish with chopped green parsley and serve to your favorite Leprechaun. 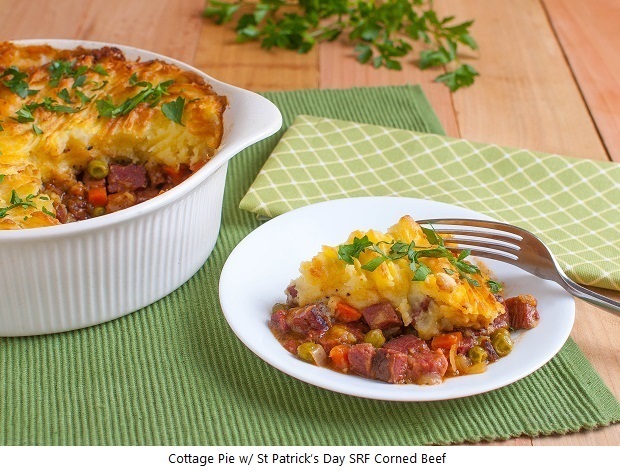 Enjoy this absolutely delicious cottage pie, using St. Patrick’s Day leftover BBQ Corned Beef!